WITHIN hours of the government announcement that Mrs Lee Kuan Yew, wife of Minister Mentor, has died on Saturday at 5.40 pm, ordinary Singaporean from all walks of life, including those living overseas, began sending in condolences and tributes on news blogs and online sites. 'She is one of the greatest people around. May she rest in peace. PM Lee hope you be strong,' said Facebook user Wljx Wayne on ST's Facebook page. Another Facebook user Pearl Foong Lye Fong expressed sadness over Mrs Lee's death, and also wished 'MM Lee to be strong and recover soon'. Netizen R.H.W.K, in comments on MSN Singapore, praised Mrs Lee as 'a great woman who did so much behind the scenes work for Singapore. Without her, we would be living in a different Singapore'. Forummers on The Straits Times (www.straitstimes.com) discussion board expressed concern for MM Lee, who said in a recent interview that he has had '61 years of happiness' with his wife, Madam Kwa Geok Choo. 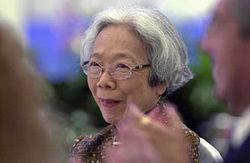 rogerkmtan lauded Mrs Lee as 'the Founding Mother of Singapore'. tankaiching2 sums the general sentiment of Mrs Lee's greatness by giving a personal anecdote of her as 'a woman with no airs who would take time to personally greet clients who came to visit her office'. He added that his 'late father who used the legal services of her law firm always spoke fondly of her'. Twitter user nastasharie said her 'prayers are with the Lee family'.